The first time we visited Nazaré about five years ago, the weather was, wet and misty which didn’t show it in its best light. We were not particularly impressed with the place. On returning this year, we saw it in the sun and a bit busier which was much nicer and we are pleased we gave it another chance. 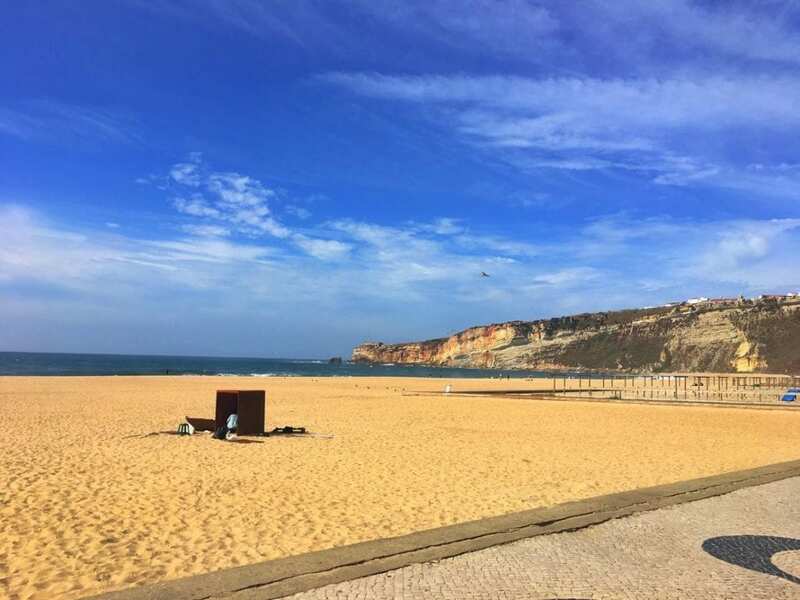 While it’s all officially one town, Nazaré is split into two distinct areas: the beach and main fishing town, and Sitio which is situated high on the cliff above the city. (Monte Sitio). We cycled from the campsite to Monte Sitio first which is the area we didn’t see last time, and we think it is the best of the two. The views were spectacular looking down from the viewpoint over the orange rooftops to the wide sandy beach and town below. It was the perfect place to have our first coffee of the day looking out over the views. Steps lead down the cliffs from here into Nazaré’s main fishing village or if you don’t want to walk, (I wouldn’t blame you). There is a funicular railway which runs down the mountain every fifteen minutes. We walked our bikes further round the headland where some local women dressed in traditional costumes were selling dried fruits, sweets and nuts. 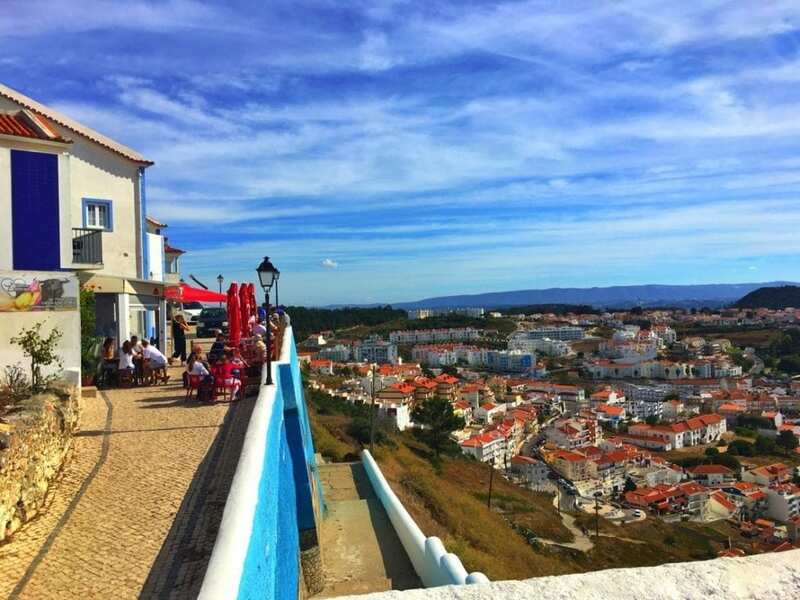 Further on we bumped our bikes down quite a few steps and arrived in the beautiful old village of Sitio da Nazaré. 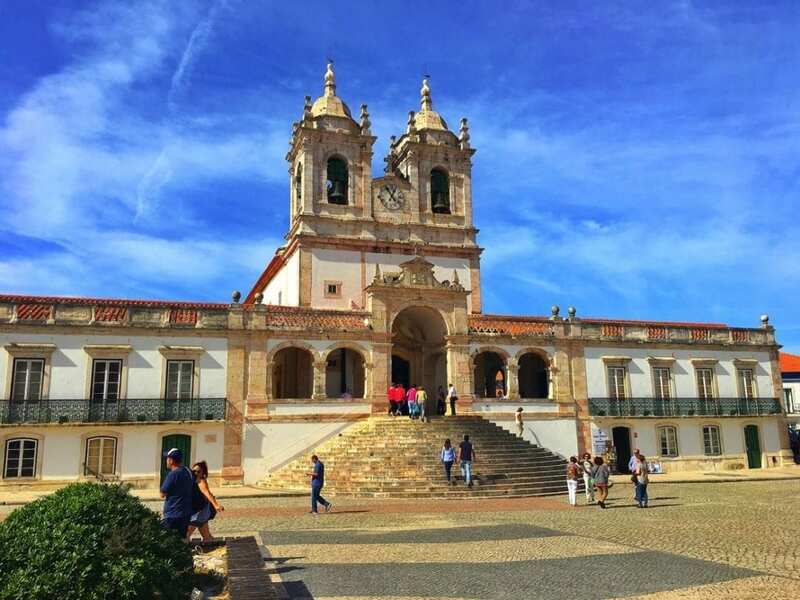 Right in front of us was a lovely large open square and the beautiful old church (The Sanctuary of Our Lady of Nazaré.) Surrounding the square was lots of restaurants, bars shops and stalls. The street vendors were selling everything from packaged nuts to kitchenware, tiles and knitted ponchos. There were lots of handmade items by local people for sale here too. I bought myself a knitted poncho – I couldn’t resist. Further round the square is the tiny chapel of Ermida da Memoria and the Manso museum. After a picnic lunch just off the square, we walked down the steep road towards the north beach to the lighthouse. We had heard about this surfing beach and the fact that you could see some of the biggest surf in the world here. This vast stretch of beach is very exposed and windswept. 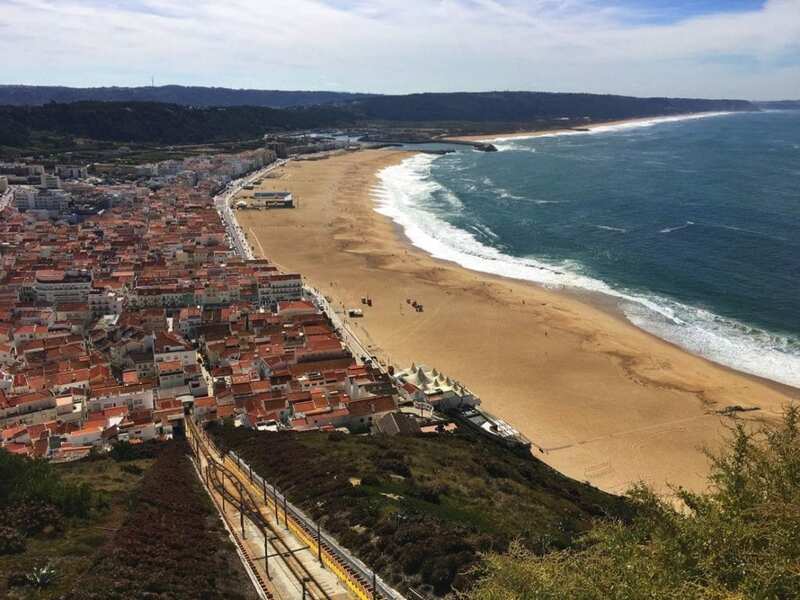 This is the area where you can see the giant waves that Nazaré has become world-famous for. Every winter from October to February the beach attracts surfers and spectators from all over the world. The winter winds, currents and the under-sea geology combine to form staggering 35m waves, which only the brave and experienced would even consider surfing. It was bustling on this stretch of road as there was a surfing competition going on and the waves were expected to be particularly impressive. 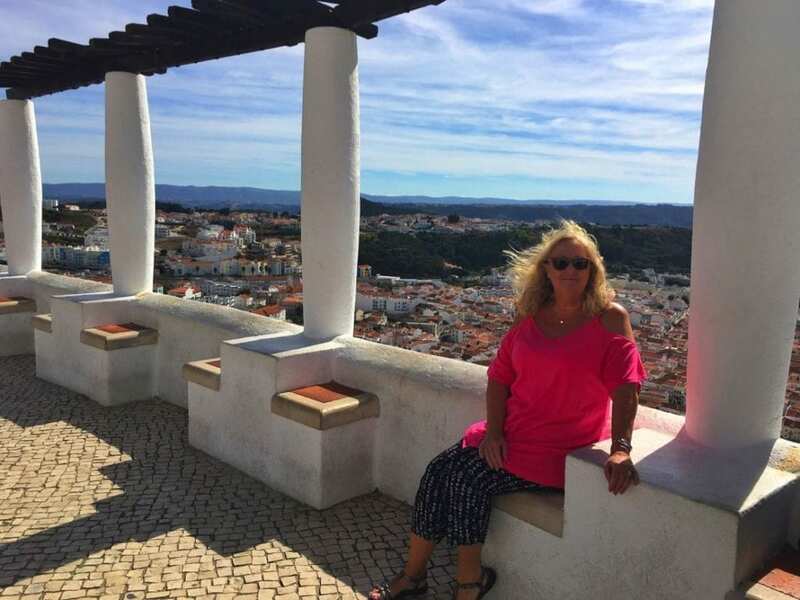 We walked on to the Farol lighthouse where you have a beautiful view of the rocky coastline. The waves that come off the Atlantic reach the lighthouse point by Sitio at monstrous proportions. Just check out this video of the waves you can expect to see here. 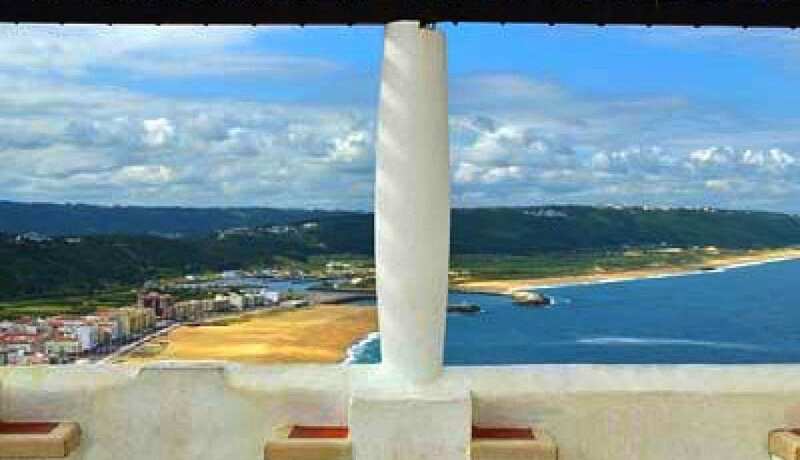 In the lighthouse area is the Miguel Arcanjo Fort which is more of a museum for surfers. 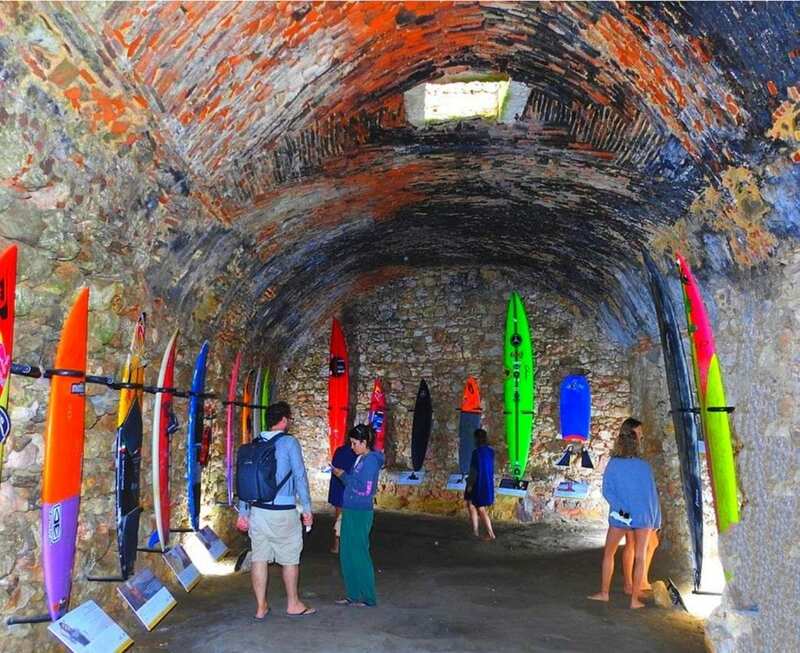 It shows the marine geology of the underwater canyon which forms the famous big waves as well as surfboards, photos and quotes from the big wave surfers. A Portuguese surfer Hugo Vau is said to have beaten the world record by surfing a 35m (114ft) high wave in Nazare in January 2018. We made our way back up to the square looking for the entrance to the funicular. Eventually, we found it and took a look to see if we could go down with our bikes. Unfortunately, it looked too steep, and there was no one around to ask about where to put them. It’s such a shame as I think it would have been an experience to ride it and the views would have been just stunning. 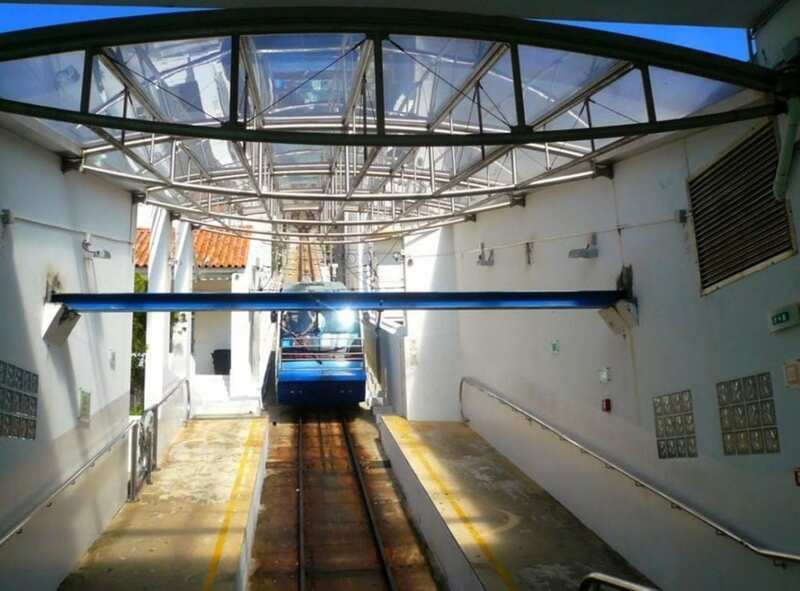 The first Nazaré funicular was installed at the end of the 19th century, and it’s been an intrinsic part of the town ever since. The current funicular is quite modern, and I’ve heard the ride is smooth although steep. We decided instead to ride down on the road. It was a fast journey down the hill, but when we got to the bottom, I wondered how the hell we (or should I say I) was going to get back up again. (Ray is a lot fitter and more experienced on his bike than me). I have to admit that it did spoil the afternoon a little as the cycle back was at the back of my mind the whole time. 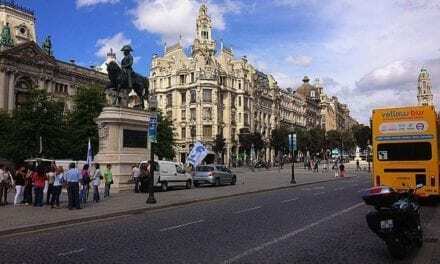 Lot’s was going through my mind – could I get Ray to go back by taxi and bring the motorhome down to put the bikes on (not such a good idea really as there was a lot of traffic and not much space to park a large motorhome. I looked at the taxis, but of course, there was no way they could transport a bike, so there was no other option than to cycle back. As it happened, I got 3/4 of the way up the main hill and pushed it up the rest before then cycling the rest of the way back to the campsite. 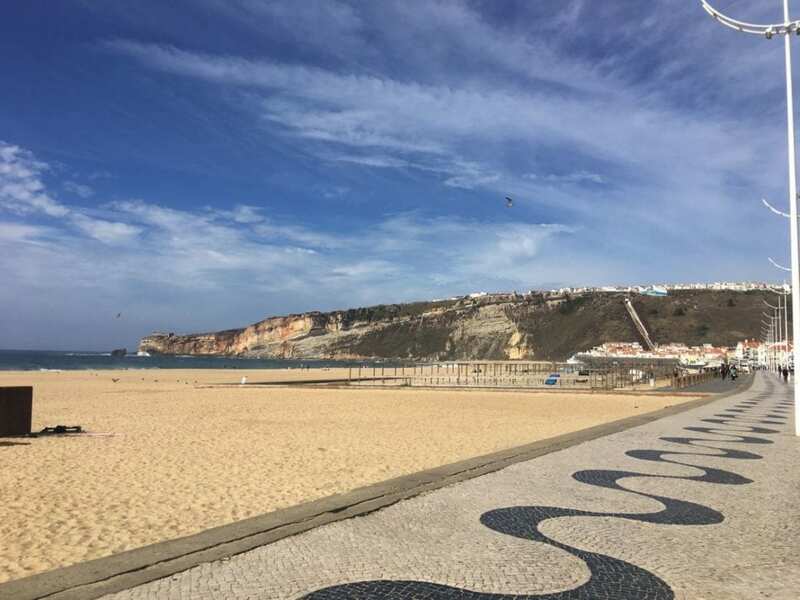 Nazaré’s crescent-shaped main beach has been voted one of the best in the country and attracts many Portuguese and international visitors in the summer. Unlike the north beach, It’s protected from the Atlantic winds by a 300 plus foot high headland. 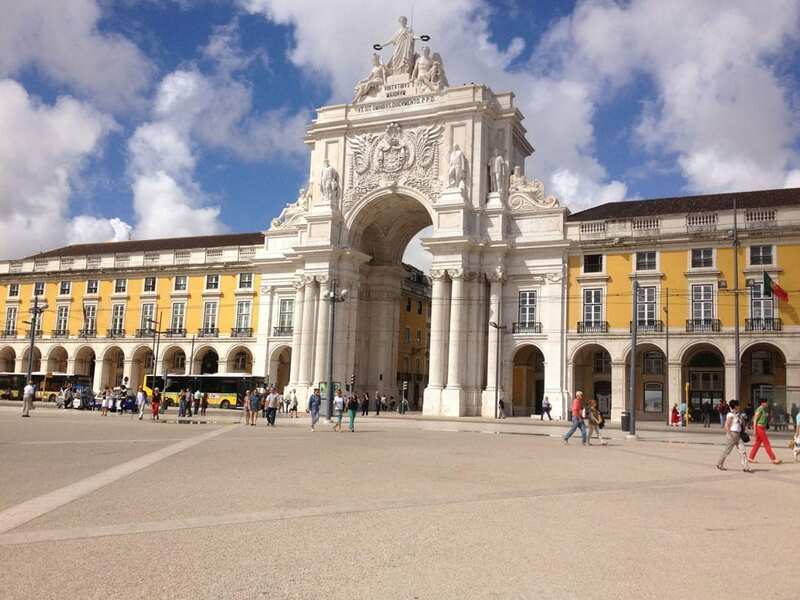 Therefore, making the area directly in front of the old town a calm and sheltered spot to sunbathe and relax. 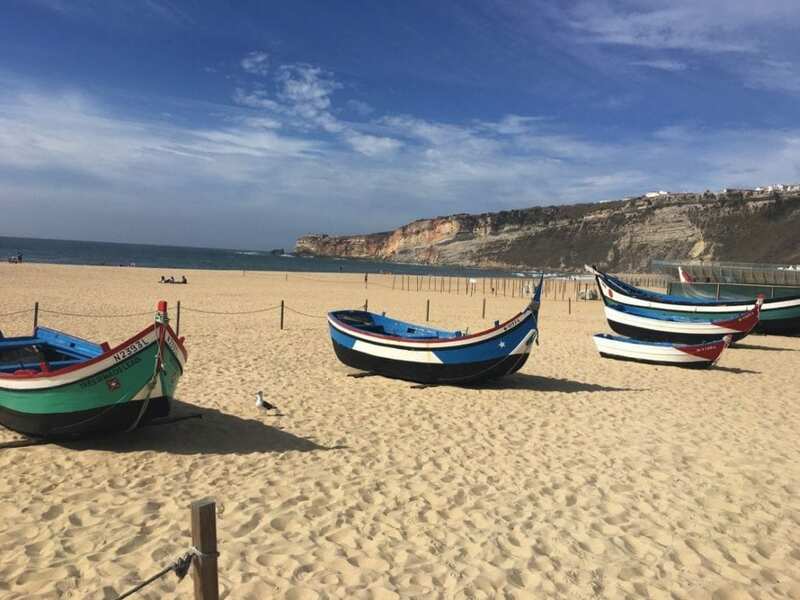 One of the charms of exploring Nazaré is seeing the older fishermen’s wives wearing the traditional costume which, it is said, they wear every day because it’s what they have always worn. The men are wearing checked shirts and trousers while the women wear several layers of ironed and starched petticoats with handstitched aprons and headscarves on their heads. All the way along opposite the promenade are many shops, ice cream parlours, restaurants and bars. 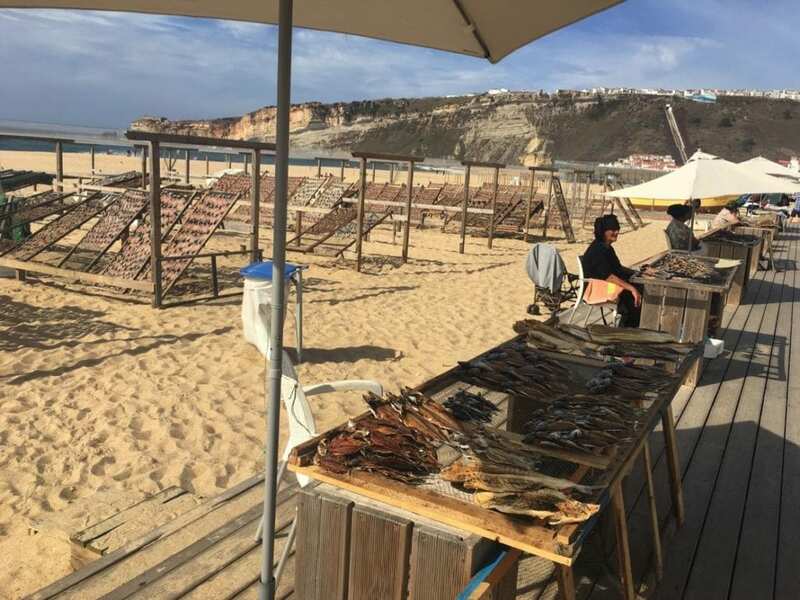 at Praia de Nazaré – arte xávega (net dragging). 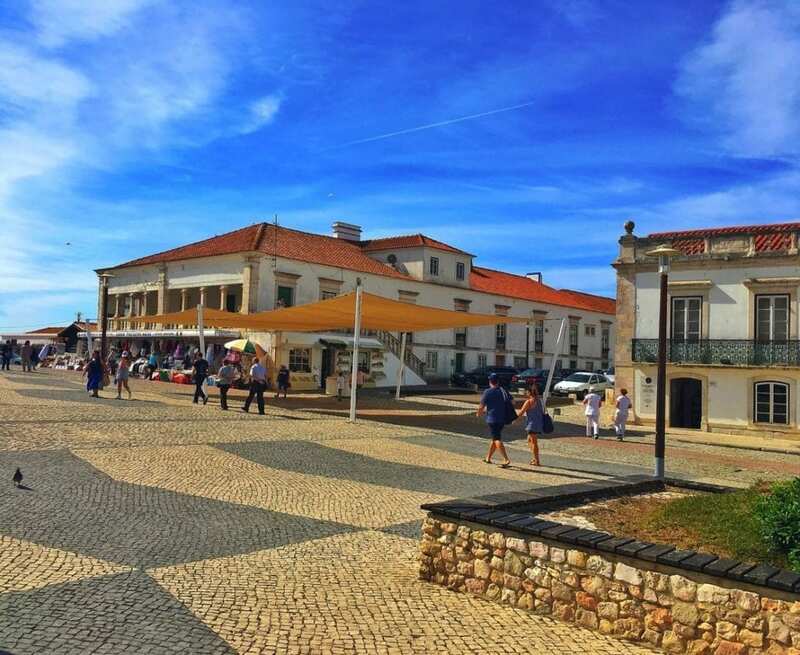 If you visit Nazare on a Friday, you’ll find a local market at the fishermen’s district. On Saturdays, in the summer you can watch the fascinating net dragging (Arte Xávega) spectacle. In the late afternoon, fishermen arrive from the sea with nets laden with fish, followed by their traditionally dressed wives loudly calling out what’s on offer. Cycling along the cycle path beside the beach we noticed a powerful smell of fish. Stopping and looking more closely we saw racks upon racks of fish drying out in the sun. These racks took up a good chunk of the beach. Elderly women were tending to the fish and selling them from makeshift stalls on the promenade. There were sardines and octopus and lots of other dried fish I didn’t recognise. The fish looked a bit too dry for us, so we gave it a miss. Very authentic though. Just along from the racks of drying fish, were several brightly painted wooden fishing boats taking pride of place on the sand by the promenade. Each with its own distinctive paint job. The town had a real holiday atmosphere to it, unlike the last time we visited when it was deserted. It was so quiet then that the shopkeepers were standing outside their shops calling us to look inside (not something we have experienced before in this part of the world. The beach is sandy and golden although the sea water is extremely cold at only 18C in the summer. In the summer, the beach is supervised by lifeguards as the currents and waves are powerful. There are a host of water activities, including stand up paddle boards, kayaks and jet-skis which you can hire from the harbour in the peak months. 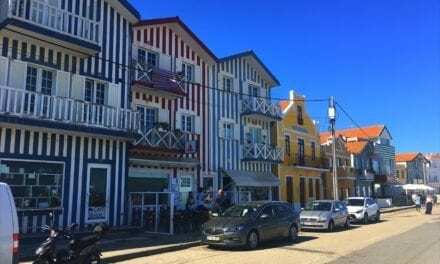 Although shiny new apartment blocks have sprung up here and there, you can still see traditional stone buildings and orange-roofed houses which is very picturesque. From the beach, we cycled just a few blocks back, and the town had a completely different feel again from the busy waterfront area. It was nice just cycling around and looking at the buildings which are old and painted white with bursts of yellow and blue. 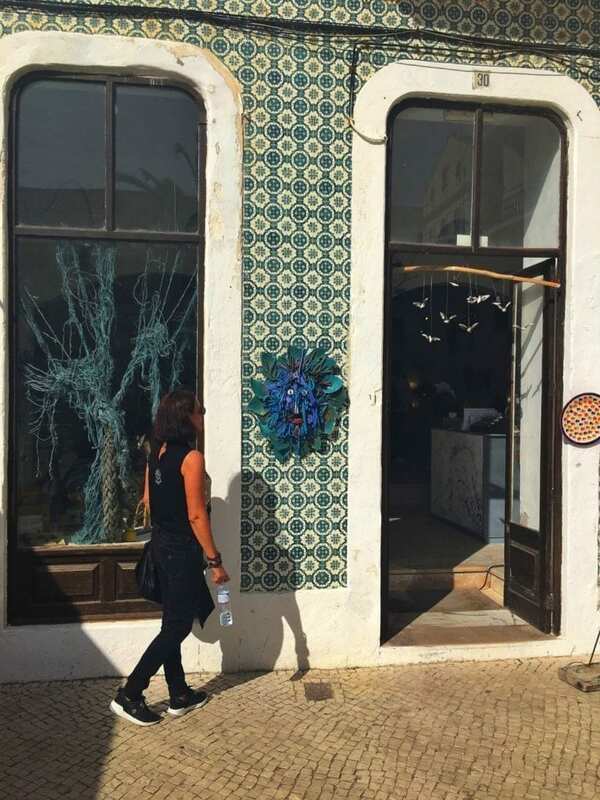 Some of the buildings had glossy patterned tiles on them typical of the Portuguese buildings. 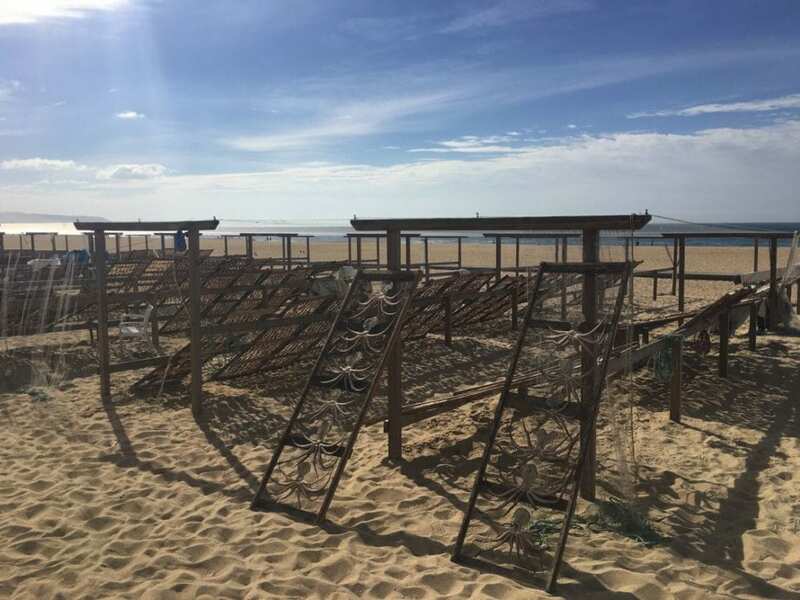 Specialities of the region include barnacles, freshly harvested from the dangerous rocks nearby, and polvo à lagareiro, a whole octopus oven-roasted in garlic and olive oil. There are many fish restaurants, as you would expect. Most of them typical and quite simple. 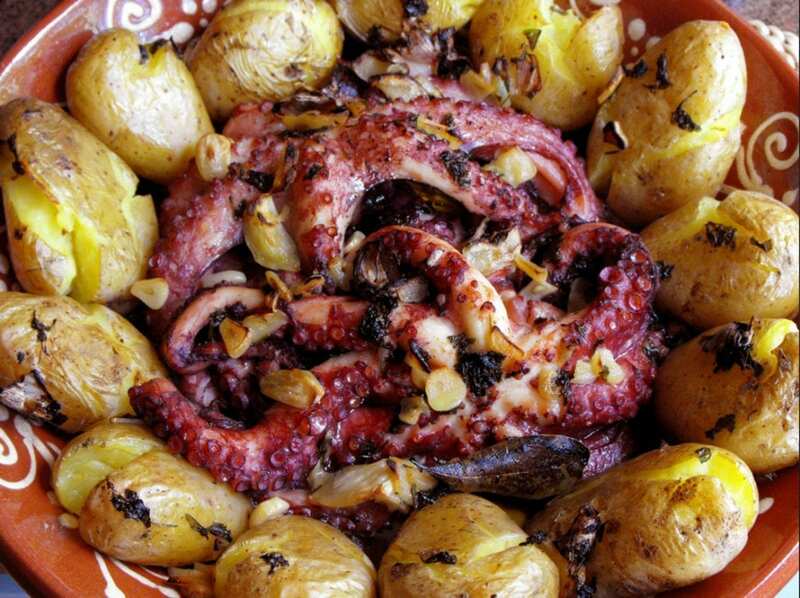 We didn’t notice much more in the way of international cuisine that you would get in the Algarve for instance. If there is anywhere in Portugal to have sardines, this is it. If you are looking for a snack and feeling adventurous, then try the salted fish left drying on nets in the sun. Not something we fancied but I’ve heard they have definitely got a memorable taste and texture! A typical Portuguese sweet that can be found on the beach is a Bola de Berlim. 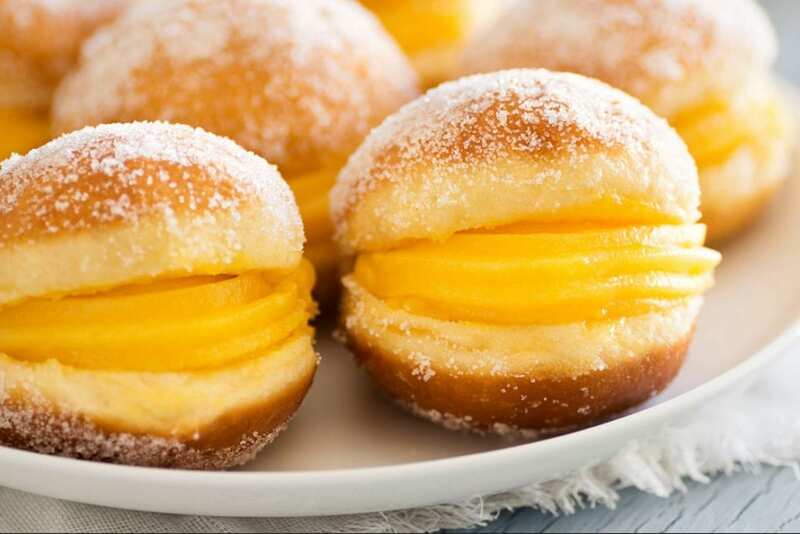 Its a delicious custard filled doughnut which was traditionally sold by old women who wandered along the beach. (Nowadays the women can no longer sell them due to hygiene laws). 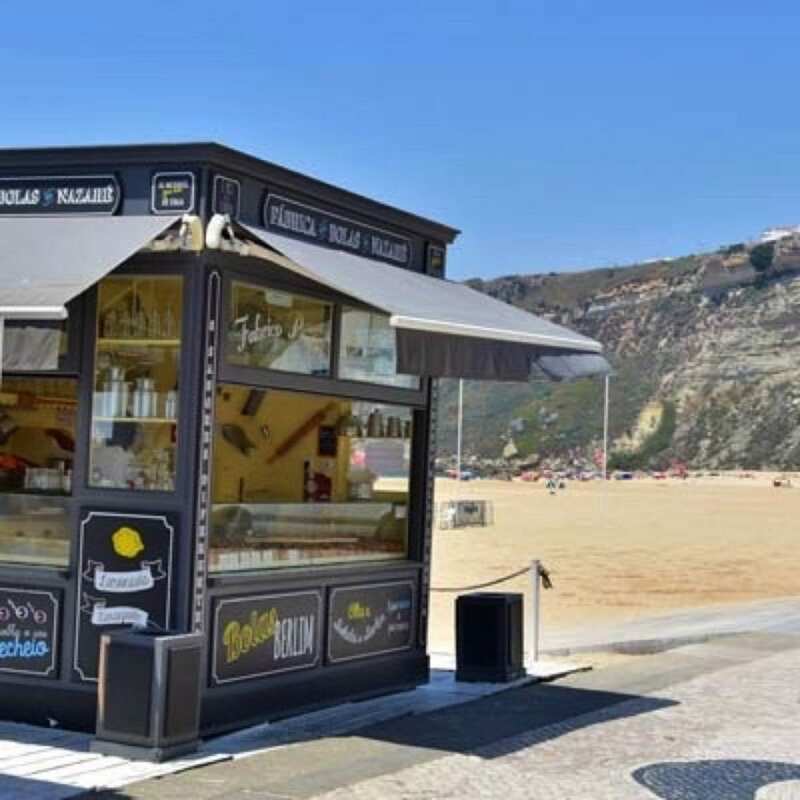 However, there are two shops on the beach promenade which sells them. Large spacious campsite with good size pitches. The site is very hilly as is the area. 4km walk down the hill to town. 2km to Lidl. Clean toilet and shower facilities. Nice site in a good location for getting into the town. There is a bus stop outside but there are only 2-3 buses a day. Taxis are cheap though.